BufferedInputStream class is used to read buffered byte stream that is a raw byte. BufferedReader class is used to read character stream. BufferedReader(Reader in) - Creates a buffering character-input stream that uses a default-sized input buffer. BufferedReader(Reader in, int sz) - Creates a buffering character-input stream that uses an input buffer of the specified size. void close() - Closes the stream and releases any system resources associated with it. 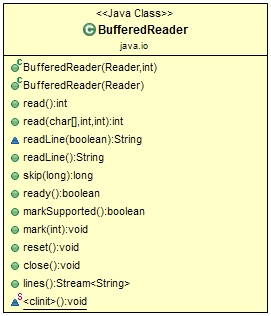 Stream lines() - Returns a Stream, the elements of which are lines read from this BufferedReader. void mark(int readAheadLimit) - Marks the present position in the stream. boolean markSupported() - Tells whether this stream supports the mark() operation, which it does. int read() - Reads a single character. int read(char cbuf, int off, int len) - Reads characters into a portion of an array. 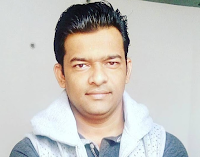 String readLine() - Reads a line of text. boolean ready() - Tells whether this stream is ready to be read. void reset() - Resets the stream to the most recent mark. long skip(long n) - Skips characters. This program reads a text file named "sample.txt" and print output to console. The "sample.txt" contains below text in it. * The class demonstrate the usage of BufferedReader class methods.